"Himalaya" and "Imaus" redirect here. For the genus of moth, see Imaus (moth). For other uses, see Himalaya (disambiguation). The Himalayas, or Himalaya (/ˌhɪməˈleɪə, hɪˈmɑːləjə/), form a mountain range in Asia, separating the plains of the Indian subcontinent from the Tibetan Plateau. The range has many of the Earth's highest peaks, including the highest, Mount Everest. The Himalayas include over fifty mountains exceeding 7,200 m (23,600 ft) in elevation, including ten of the fourteen 8,000-metre peaks. By contrast, the highest peak outside Asia (Aconcagua, in the Andes) is 6,961 m (22,838 ft) tall. The general location of the Himalayas mountain range (this map has the Hindu Kush in the Himalaya, not normally regarded as part of the core Himalayas). The name of the range derives from the Sanskrit Himā-laya (हिमालय, "Abode of Snow"), from himá (हिम, "snow") and ā-laya (आलय, "receptacle, dwelling"). They are now known as the "Himalaya Mountains", usually shortened to the "Himalayas". Formerly, they were described in the singular as the Himalaya. This was also previously transcribed Himmaleh, as in Emily Dickinson's poetry and Henry David Thoreau's essays. The mountains are known as the Himālaya in Nepali and Hindi (both written हिमालय), the Himalaya (ཧི་མ་ལ་ཡ་) or 'The Land of Snow' (གངས་ཅན་ལྗོངས་) in Tibetan, the Hamaleh Mountain Range (Urdu: سلسلہ کوہ ہمالیہ‎) in Urdu and the Ximalaya Mountain Range (Chinese: 喜馬拉雅山脈; pinyin: Xǐmǎlāyǎ Shānmài) in Chinese. In the middle of the great curve of the Himalayan mountains lie the 8,000 m (26,000 ft) peaks of Dhaulagiri and Annapurna in Nepal, separated by the Kali Gandaki Gorge. 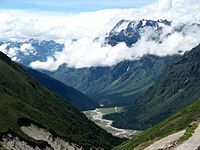 The gorge splits the Himalayas into Western and Eastern sections both ecologically and orographically – the pass at the head of the Kali Gandaki, the Kora La is the lowest point on the ridgeline between Everest and K2. To the east of Annapurna are the 8,000 m (5.0 mi) peaks of Manaslu and across the border in Tibet, Shishapangma. To the south of these lies Kathmandu, the capital of Nepal and the largest city in the Himalayas. East of the Kathmandu Valley lies valley of the Bhote/Sun Kosi river which rises in Tibet and provides the main overland route between Nepal and China – the Araniko Highway/China National Highway 318. Further east is the Mahalangur Himal with four of the world's six highest mountains, including the highest: Cho Oyu, Everest, Lhotse and Makalu. The Khumbu region, popular for trekking, is found here on the south-western approaches to Everest. The Arun river drains the northern slopes of these mountains, before turning south and flowing through the range to the east of Makalu. In the far east of Nepal, the Himalayas rise to the Kanchenjunga massif on the border with India, the third highest mountain in the world, the most easterly 8,000 m (26,000 ft) summit and the highest point of India. The eastern side of Kanchenjunga is in the Indian state of Sikkim. Formerly an independent Kingdom, it lies on the main route from India to Lhasa, Tibet, which passes over the Nathu La pass into Tibet. East of Sikkim lies the ancient Buddhist Kingdom of Bhutan. The highest mountain in Bhutan is Gangkhar Puensum, which is also a strong candidate for the highest unclimbed mountain in the world. The Himalayas here are becoming increasingly rugged with heavily forested steep valleys. The Himalayas continue, turning slightly northeast, through the Indian State of Arunachal Pradesh as well as Tibet, before reaching their easterly conclusion in the peak of Namche Barwa, situated in Tibet inside the great bend of the Yarlang Tsangpo river. On the other side of the Tsangpo, to the east, are the Kangri Garpo mountains. The high mountains to the north of the Tsangpo including Gyala Peri, however, are also sometimes also included in the Himalayas. Going west from Dhaulagiri, Western Nepal is somewhat remote and lacks major high mountains, but is home to Rara Lake, the largest lake in Nepal. The Karnali River rises in Tibet but cuts through the center of the region. Further west, the border with India follows the Sarda River and provides a trade route into China, where on the Tibetan plateau lies the high peak of Gurla Mandhata. Just across Lake Manasarovar from this lies the sacred Mount Kailash, which stands close to the source of the four main rivers of Himalayas and is revered in Hinduism, Buddhism, Sufism, Jainism, and Bonpo. In the newly created Indian state of Uttarkhand, the Himalayas rise again as the Garhwal Himalayas with the high peaks of Nanda Devi and Kamet. The state is also an important pilgrimage destination, with the source of the Ganges at Gangotri and the Yamuna at Yamunotri, and the temples at Badrinath and Kedarnath. The next Himalayan Indian state, Himachal Pradesh, it is noted for its hill stations, particularly Shimla, the summer capital of the British Raj, and Dharmasala, the centre of the Tibetan community in exile in India. This area marks the start of the Punjab Himalaya and the Sutlej river, the most easterly of the five tributaries of the Indus, cuts through the range here. Further west, the Himalayas form most of the southern portion of the Indian State of Jammu & Kashmir. The twin peaks of Nun Kun are the only mountains over 7,000 m (4.3 mi) in this part of the Himalayas. Beyond lies the renown Kashmir Valley and the town and lakes of Srinagar. Finally, the Himalayas cross the Line of Control into Pakistan and reach their western end in the dramatic 8000 m peak of Nanga Parbat, which rises over 7,000 m (23,000 ft) above the Indus valley and is the most westerly of the 8000 m summits. The Himalayan range is one of the youngest mountain ranges on the planet and consists mostly of uplifted sedimentary and metamorphic rock. According to the modern theory of plate tectonics, its formation is a result of a continental collision or orogeny along the convergent boundary between the Indo-Australian Plate and the Eurasian Plate. The Arakan Yoma highlands in Myanmar and the Andaman and Nicobar Islands in the Bay of Bengal were also formed as a result of this collision. During the Upper Cretaceous, about 70 million years ago, the north-moving Indo-Australian Plate (which has subsequently broken into the Indian Plate and the Australian Plate) was moving at about 15 cm (5.9 in) per year. About 50 million years ago this fast moving Indo-Australian Plate had completely closed the Tethys Ocean, the existence of which has been determined by sedimentary rocks settled on the ocean floor and the volcanoes that fringed its edges. Since both plates were composed of low density continental crust, they were thrust faulted and folded into mountain ranges rather than subducting into the mantle along an oceanic trench. An often-cited fact used to illustrate this process is that the summit of Mount Everest is made of marine limestone from this ancient ocean. Today, the Indian plate continues to be driven horizontally at the Tibetan Plateau, which forces the plateau to continue to move upwards. The Indian plate is still moving at 67 mm per year, and over the next 10 million years it will travel about 1,500 km (930 mi) into Asia. About 20 mm per year of the India-Asia convergence is absorbed by thrusting along the Himalaya southern front. This leads to the Himalayas rising by about 5 mm per year, making them geologically active. The movement of the Indian plate into the Asian plate also makes this region seismically active, leading to earthquakes from time to time. During the last ice age, there was a connected ice stream of glaciers between Kangchenjunga in the east and Nanga Parbat in the west. In the west, the glaciers joined with the ice stream network in the Karakoram, and in the north, they joined with the former Tibetan inland ice. To the south, outflow glaciers came to an end below an elevation of 1,000–2,000 m (3,300–6,600 ft). While the current valley glaciers of the Himalaya reach at most 20 to 32 km (12 to 20 mi) in length, several of the main valley glaciers were 60 to 112 km (37 to 70 mi) long during the ice age. The glacier snowline (the altitude where accumulation and ablation of a glacier are balanced) was about 1,400–1,660 m (4,590–5,450 ft) lower than it is today. Thus, the climate was at least 7.0 to 8.3 °C (12.6 to 14.9 °F) colder than it is today. The western rivers combine into the Indus Basin. The Indus itself forms the northern and western boundaries of the Himalayas. It begins in Tibet at the confluence of Sengge and Gar rivers and flows north-west through India into Pakistan before turning south-west to the Arabian Sea. It is fed by several major tributaries draining the southern slopes of the Himalayas, including the Jhelum, Chenab, Ravi, Beas and Sutlej rivers, the five rivers of the Punjab. The other Himalayan rivers drain the Ganges-Brahmaputra Basin. Its main rivers are the Ganges, the Brahmaputra and the Yamuna, as well as other tributaries. The Brahmaputra originates as the Yarlung Tsangpo River in western Tibet, and flows east through Tibet and west through the plains of Assam. The Ganges and the Brahmaputra meet in Bangladesh and drain into the Bay of Bengal through the world's largest river delta, the Sunderbans. The northern slopes of Gyala Peri and the peaks beyond the Tsangpo, sometimes included in the Himalayas, drain into the Irrawaddy River, which originates in eastern Tibet and flows south through Myanmar to drain into the Andaman Sea. The Salween, Mekong, Yangtze and Yellow River all originate from parts of the Tibetan Plateau that are geologically distinct from the Himalaya mountains and are therefore not considered true Himalayan rivers. Some geologists refer to all the rivers collectively as the circum-Himalayan rivers. The great ranges of central Asia, including the Himalayas, contain the third-largest deposit of ice and snow in the world, after Antarctica and the Arctic. The Himalayan range encompasses about 15,000 glaciers, which store about 12,000 km3 (2,900 cu mi) of fresh water. Its glaciers include the Gangotri and Yamunotri (Uttarakhand) and Khumbu glaciers (Mount Everest region), Langtang glacier (Langtang region) and Zemu (Sikkim). Owing to the mountains' latitude near the Tropic of Cancer, the permanent snow line is among the highest in the world at typically around 5,500 m (18,000 ft). In contrast, equatorial mountains in New Guinea, the Rwenzoris and Colombia have a snow line some 900 m (2,950 ft) lower. The higher regions of the Himalayas are snowbound throughout the year, in spite of their proximity to the tropics, and they form the sources of several large perennial rivers. In recent years, scientists have monitored a notable increase in the rate of glacier retreat across the region as a result of global climate change. For example, glacial lakes have been forming rapidly on the surface of debris-covered glaciers in the Bhutan Himalaya during the last few decades. Although the effect of this will not be known for many years, it potentially could mean disaster for the hundreds of millions of people who rely on the glaciers to feed the rivers during the dry seasons. The Himalayan region is dotted with hundreds of lakes. Most of the larger lakes are on the northern side of the main range. The most famous is the sacred freshwater Lake Manasarovar, near to Mount Kailas with an area of 410 km2 (160 sq mi) and an altitude of 4,590 m (15,060 ft). It drains into the nearby Lake Rakshastal with an area of 250 km2 (97 sq mi) and slightly lower at 4,575 m (15,010 ft). Pangong Tso, which is spread across the border between India and China, at far western end of Tibet, and Yamdrok Tso, located in south central Tibet, are among the largest with surface areas of 700 km2 (270 sq mi), and 638 km2 (246 sq mi), respectively. Lake Puma Yumco is one of the highest of the larger lakes at an elevation of 5,030 m (16,500 ft). South of the main range, the lakes are smaller. Tilicho Lake in Nepal in the Annapurna massif is one of the highest lakes in the world. Other notable lakes include Rara Lake in western Nepal, She-Phoksundo Lake in the Shey Phoksundo National Park of Nepal, Gurudongmar Lake, in North Sikkim, Gokyo Lakes in Solukhumbu district of Nepal and Lake Tsongmo, near the Indo-China border in Sikkim. Some of the lakes present a danger of a glacial lake outburst flood. The Tsho Rolpa glacier lake in the Rowaling Valley, in the Dolakha District of Nepal, is rated as the most dangerous. The lake, which is located at an altitude of 4,580 m (15,030 ft) has grown considerably over the last 50 years due to glacial melting. The mountain lakes are known to geographers as tarns if they are caused by glacial activity. Tarns are found mostly in the upper reaches of the Himalaya, above 5,500 m (18,000 ft). The vast size, huge altitude range and complex topography of the Himalayas mean they experience a wide range of climates, from humid subtropical in the foothills to cold, dry desert conditions on the Tibetan side of the range. For much of Himalayas – that on the south side of the high mountains, except in the furthest west, the most characteristic feature of the climate is the monsoon. Heavy rain arrives on the south-west monsoon in June and persists until September. The monsoon can seriously impact transport and cause major landslides. It restricts tourism – the trekking and mountaineering season is limited to either before the monsoon in April/May or after the monsoon in October/November (autumn). In Nepal and Sikkim, there are often considered to be five seasons: summer, monsoon, autumn (or post-monsoon), winter and spring. Using the Köppen climate classification, the lower elevations of the Himalayas, reaching in mid elevations in central Nepal (including the Kathmandu valley), are classified as Cwa, Humid subtropical climate with dry winters. Higher up, most of the Himalayas have a subtropical highland climate (Cwb). In the furthest west of the Himalayas, in the west of the Kashmir valley and the Indus valley, the South Asian monsoon is no longer a dominant factor and most precipitation falls in the spring. Srinagar receives around 723 mm (28 in) around half the rainfall of locations such as Shimla and Kathmandu, with the wettest months being March and April. The northern side of the Himalayas, also known as the Tibetan Himalaya, is dry, cold and generally wind swept particularly in the west where it has a cold desert climate. The vegetation is sparse and stunted and the winters are severely cold. Most of the precipitation in the region is in the form of snow during late winter and spring months. Local impacts on climate are significant throughout the Himalayas. Temperatures fall by 6.5 °C (11.7 °F) for every 1,000 m (3,300 ft) rise in altitude. This gives rise to a variety of climates from nearly tropical in the foothills to tundra and permanent snow and ice. Local climate is also affected by the topography: The leeward side of the mountains receive less rain while the well exposed slopes get heavy rainfall and the rain shadow of large mountains can be significant, for example leading to near desert conditions in the Upper Mustang which is sheltered from the monsoon rains by the Annapurna and Dhaulagiri massifs and has annual precipitation of around 300 mm (12 in), while Pokhara on the southern side of the massifs has substantial rainfall (3,900 mm or 150 in a year). Thus although annual precipitation is generally higher in east than the west, local variations are often more important. The Himalayas have a profound effect on the climate of the Indian subcontinent and the Tibetan Plateau. They prevent frigid, dry winds from blowing south into the subcontinent, which keeps South Asia much warmer than corresponding temperate regions in the other continents. It also forms a barrier for the monsoon winds, keeping them from traveling northwards, and causing heavy rainfall in the Terai region. The Himalayas are also believed to play an important part in the formation of Central Asian deserts, such as the Taklamakan and Gobi. The flora and fauna of the Himalayas vary with climate, rainfall, altitude, and soils. The climate ranges from tropical at the base of the mountains to permanent ice and snow at the highest elevations. The amount of yearly rainfall increases from west to east along the southern front of the range. This diversity of altitude, rainfall and soil conditions combined with the very high snow line supports a variety of distinct plant and animal communities. The extremes of high altitude (low atmospheric pressure) combined with extreme cold favor extremophile organisms. At high altitudes, the elusive and previously endangered snow leopard is the main predator. Its prey includes members of the goat family grazing on the alpine pastures and living on the rocky terrain, notably the endemic bharal or Himalayan blue sheep. The Himalayan musk deer is also found at high altitude. Hunted for its musk, it is now rare and endangered. Other endemic or near endemic herbivores include the Himalayan tahr, the takin, the Himalayan serow, and the Himalayan goral. The critically endangered Himalayan subspecies of the brown bear is found sporadically across the range as is the Asian black bear. In the mountainous mixed deciduous and conifer forests of the eastern Himalayas, Red panda feed in the dense understories of bamboo. Lower down the forests of the foothills are inhabited by several different primates, including the endangered Gee's golden langur and the Kashmir gray langur, with highly restricted ranges in the east and west of the Himalayas respectively. The unique floral and faunal wealth of the Himalayas is undergoing structural and compositional changes due to climate change. Hydrangea hirta is an example of floral species that can be found in this area. The increase in temperature is shifting various species to higher elevations. The oak forest is being invaded by pine forests in the Garhwal Himalayan region. There are reports of early flowering and fruiting in some tree species, especially rhododendron, apple and box myrtle. The highest known tree species in the Himalayas is Juniperus tibetica located at 4,900 m (16,080 ft) in Southeastern Tibet. The Himalayan population belongs to four distinct cultural groups, who throughout history have systematically penetrated the isolated indigenous Himalayan population. Those migrating cultures – Hindu (Indian), Buddhist (Tibetan), Islamic (Afghanistan–Iranian) and Animist (Burmese and southeast Asian) – have created here their own individual and unique place. Their current arrangement, though with a few exceptions, is linked to specific geographical regions, and the relative altitude at which they occur. There are many cultural aspects of the Himalayas. In Jainism, Mount Ashtapad in Himalayas is a sacred place where the first Jain Tirthankara, Rishabhdeva attained moksha. It is believed that after Rishabhdeva attained nirvana, his son, Emperor Bharata Chakravartin, had constructed three stupas and twenty four shrines of the 24 Tirthankaras with their idols studded with precious stones over there and named it Sinhnishdha. For the Hindus, the Himalayas are personified as Himavath, the father of the goddess Parvati. The Himalayas is also considered to be the father of the river Ganges. Two of the most sacred places of pilgrimage for the Hindus is the temple complex in Pashupatinath and Muktinath, also known as Saligrama because of the presence of the sacred black rocks called saligrams. The Buddhists also lay a great deal of importance on the mountains of the Himalayas. Paro Taktsang is the holy place where Buddhism started in Bhutan. The Muktinath is also a place of pilgrimage for the Tibetan Buddhists. They believe that the trees in the poplar grove came from the walking sticks of eighty-four ancient Indian Buddhist magicians or mahasiddhas. They consider the saligrams to be representatives of the Tibetan serpent deity known as Gawo Jagpa. In Indian tradition, Rishabhdev's son Emperor Bharata Chakravartin, after whom India was believed to be named Bharatvarsha attained nirvana at Mount Kailash. The Himalayan people's diversity shows in many different ways. It shows through their architecture, their languages and dialects, their beliefs and rituals, as well as their clothing. The shapes and materials of the people's homes reflect their practical needs and the beliefs. Another example of the diversity amongst the Himalayan peoples is that handwoven textiles display colors and patterns unique to their ethnic backgrounds. Finally, some people place a great importance on jewellery. The Rai and Limbu women wear big gold earrings and nose rings to show their wealth through their jewellery. The Taktsang Monastery, Bhutan, also known as the "Tiger's Nest"
Several places in the Himalayas are of religious significance in Hinduism, Buddhism, Jainism and Sikhism. A notable example of a religious site is Paro Taktsang, where Padmasambhava is said to have founded Buddhism in Bhutan. Padmasambhava is also worshipped as the patron saint of Sikkim. There are also Muslim and Hindhu Shaivite Kashmiri Pandit in the area of Kashmir. In Hinduism, the Himalayas have been personified as the king of all Mountain – "Giriraj Himavat", father of Ganga and Parvati (form of Adi Shakti Durga). A number of Vajrayana Buddhist sites are situated in the Himalayas, in Tibet, Bhutan and in the Indian regions of Ladakh, Sikkim, Arunachal Pradesh, Spiti and Darjeeling. There were over 6,000 monasteries in Tibet, including the residence of the Dalai Lama. Bhutan, Sikkim and Ladakh are also dotted with numerous monasteries. The Tibetan Muslims have their own mosques in Lhasa and Shigatse. The Himalayas are home to a diversity of medicinal resources. Plants from the forests have been used for millennia to treat conditions ranging from simple coughs to snake bites. Different parts of the plants – root, flower, stem, leaves, and bark – are used as remedies for different ailments. For example, a bark extract from an abies pindrow tree is used to treat coughs and bronchitis. Leaf and stem paste from an arachne cordifolia is used for wounds and as an antidote for snake bites. The bark of a callicarpa arborea is used for skin ailments. Nearly a fifth of the gymnosperms, angiosperms and pteridophytes in the Himalayas are found to have medicinal properties, and more are likely to be discovered. Most of the population in some Asian and African countries depend on medicinal plants rather than prescriptions and such. Since so many people use medicinal plants as their only source of healing in the Himalayas, the plants are an important source of income. This contributes to economic and modern industrial development both inside and outside the region. The only problem is that locals are rapidly clearing the forests on the Himalayas for wood, often illegally. This means that the number of medicinal plants is declining and that some of them might become rarer or, in some cases, go extinct. Although locals are clearing out portions of the forests in the Himalayas, there is still a large amount of greenery ranging from the tropical forests to the Alpine forests. These forests provide wood for fuel and other raw materials for use by industries. There are also many pastures for animals to graze upon. The many varieties of animals that live in these mountains do so based on the elevation. For example, elephants and rhinoceros live in the lower elevations of the Himalayas, also called the Terai region. Also, found in these mountains are the Kashmiri stag, black bears, musk deer, langur, and snow leopards. The Tibetan yak are also found on these mountains and are often used by the people for transportation. However, the populations of many of these animals and still others are declining and are on the verge of going extinct. The Himalayas are also a source of many minerals and precious stones. Amongst the tertiary rocks, are vast potentials of mineral oil. There is coal located in Kashmir, and precious stones located in the Himalayas. There is also gold, silver, copper, zinc, and many other such minerals and metals located in at least 100 different places in these mountains. ^ Yang, Qinye; Zheng, Du (2004). Himalayan Mountain System. ISBN 978-7-5085-0665-4. Retrieved 30 July 2016. ^ Le Fort, P. (1975), Himalayas: The collided range. Present knowledge of the continental arc (PDF), American Journal of Science 275A: 1–44. ^ a b c Apollo, M. (2017). The population of Himalayan regions – by the numbers: Past, present and future. [In:] R. Efe, M. Öztürk (eds. ), Contemporary Studies in Environment and Tourism, Chapter: 9 (pp.143–159). Publisher: Cambridge Scholars Publishing. ^ "Definition of Himalayas". Oxford Dictionaries Online. Retrieved 9 May 2011. ^ Dickinson, Emily, "The Himmaleh was known to stoop" . ^ Thoreau, Henry David (1849), A Week on the Concord and Merrimack Rivers . ^ a b "The Himalayas: Two continents collide". USGS. 5 May 1999. Retrieved 3 January 2015. ^ "Plate Tectonics -The Himalayas". The Geological Society. Retrieved 13 September 2016. ^ a b c Kuhle, M. (2011). "The High Glacial (Last Ice Age and Last Glacial Maximum) Ice Cover of High and Central Asia, with a Critical Review of Some Recent OSL and TCN Dates". In Ehlers, J.; Gibbard, P.L. ; Hughes, P.D. (eds.). Quaternary Glaciation – Extent and Chronology, A Closer Look. Amsterdam: Elsevier BV. pp. 943–965. ^ Kuhle, M. (1987). "Subtropical mountain- and highland-glaciation as ice age triggers and the waning of the glacial periods in the Pleistocene". GeoJournal. 14 (4): 393–421. doi:10.1007/BF02602717. ^ Kuhle, M. (2005). "The maximum Ice Age (Würmian, Last Ice Age, LGM) glaciation of the Himalaya – a glaciogeomorphological investigation of glacier trim-lines, ice thicknesses and lowest former ice margin positions in the Mt. Everest-Makalu-Cho Oyu massifs (Khumbu- and Khumbakarna Himal) including information on late-glacial-, neoglacial-, and historical glacier stages, their snow-line depressions and ages". GeoJournal. 62 (3–4): 193–650. doi:10.1007/s10708-005-2338-6. ^ "Sunderbans the world's largest delta". gits4u.com. Archived from the original on 3 January 2015. Retrieved 3 January 2015. ^ Gaillardet, J.; Métivier, F.; Lemarchand, D.; Dupré, B.; Allègre, C.J. ; Li, W.; Zhao, J. (2003). "Geochemistry of the Suspended Sediments of Circum-Himalayan Rivers and Weathering Budgets over the Last 50 Myrs" (PDF). Geophysical Research Abstracts. 5: 13,617. Bibcode:2003EAEJA....13617G. Abstract 13617. Retrieved 4 November 2006. ^ "The Himalayas – Himalayas Facts". Nature on PBS. 11 February 2011. Retrieved 21 January 2014. ^ "the Himalayan Glaciers". Fourth assessment report on climate change. IPPC. 2007. Retrieved 22 January 2014. ^ Shi, Yafeng; Xie, Zizhu; Zheng, Benxing; Li, Qichun (1978). "Distribution, Feature and Variations of Glaciers in China" (PDF). World Glacier Inventory. Archived from the original (PDF) on 16 December 2012. ^ Henderson-Sellers, Ann; McGuffie, Kendal (2012). The Future of the World's Climate: A Modelling Perspective. pp. 199–201. ISBN 978-0-12-386917-3. ^ "Vanishing Himalayan Glaciers Threaten a Billion". Reuters. 4 June 2007. Retrieved 13 March 2018. ^ "Glaciers melting at alarming speed". People's Daily Online. 24 July 2007. Retrieved 17 April 2009. ^ Drews, Carl. "Highest Lake in the World". Retrieved 14 November 2010. ^ Devitt, Terry (3 May 2001). "Climate shift linked to rise of Himalayas, Tibetan Plateau". University of Wisconsin–Madison News. Retrieved 1 November 2011. ^ Hogan, C. Michael (2010). Monosson, E. (ed.). "Extremophile". Encyclopedia of Earth. Washington, DC: National Council for Science and the Environment. ^ Miehe, Georg; Miehe, Sabine; Vogel, Jonas; Co, Sonam; Duo, La (May 2007). "Highest Treeline in the Northern Hemisphere Found in Southern Tibet" (PDF). Mountain Research and Development. 27 (2): 169–173. doi:10.1659/mrd.0792. Archived from the original (PDF) on 6 June 2013. ^ Jain, Arun Kumar (2009). Faith & Philosophy of Jainism. ISBN 978-81-7835-723-2. ^ "To heaven and back". Articles.timesofindia.indiatimes.com. 11 January 2012. Retrieved 2 March 2012. ^ a b c Gupta, Pankaj; Sharma, Vijay Kumar (2014). Healing Traditions of the Northwestern Himalayas. Springer Briefs in Environmental Science. ISBN 978-81-322-1925-5. ^ a b c d Jahangeer A. Bhat; Munesh Kumar; Rainer W. Bussmann (2 January 2013). "Ecological status and traditional knowledge of medicinal plants in Kedarnath Wildlife Sanctuary of Garhwal Himalaya, India". Journal of Ethnobiology and Ethnomedicine. 9: 1. doi:10.1186/1746-4269-9-1. PMC 3560114. PMID 23281594. ^ Cantor, Kimberly (14 July 2016). "Paro, Bhutan: The Tiger's Nest". Huffington Post. Retrieved 9 June 2018. ^ a b c Zurick, David; Julsun, Pacheco; Basanta, Raj Shrestha; Birendra, Bajracharya (2006). Illustrated Atlas of the Himalaya. Lexington: U of Kentucky. ^ Jain Pooja-Kavya: Ek Chintan. ISBN 978-81-263-0818-7. ^ Pommaret, Francoise (2006). Bhutan Himalayan Mountains Kingdom (5th ed.). Odyssey Books and Guides. pp. 136–137. ISBN 978-962-217-810-6. ^ Dallapiccola, Anna (2002). Dictionary of Hindu Lore and Legend. ISBN 978-0-500-51088-9. ^ "Tibetan monks: A controlled life". BBC News. 20 March 2008. ^ "Mosques in Lhasa, Tibet". People's Daily Online. 27 October 2005. ^ "Himalayan Forests Disappearing". Earth Island Journal. 21 (4): 7–8. 2006. 'The Mighty Himalaya: A Fragile Heritage,’ National Geographic, 174:624–631 (November 1988). Turner, Bethan, et al. Seismicity of the Earth 1900–2010: Himalaya and Vicinity. Denver, United States Geological Survey, 2013. Wikivoyage has a travel guide for Himalayas.